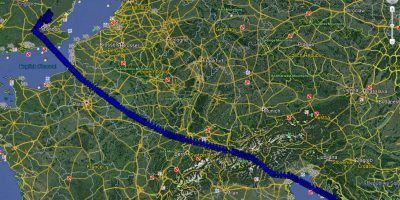 Google Earth is a handy tool to browse terrain in any part of the globe. 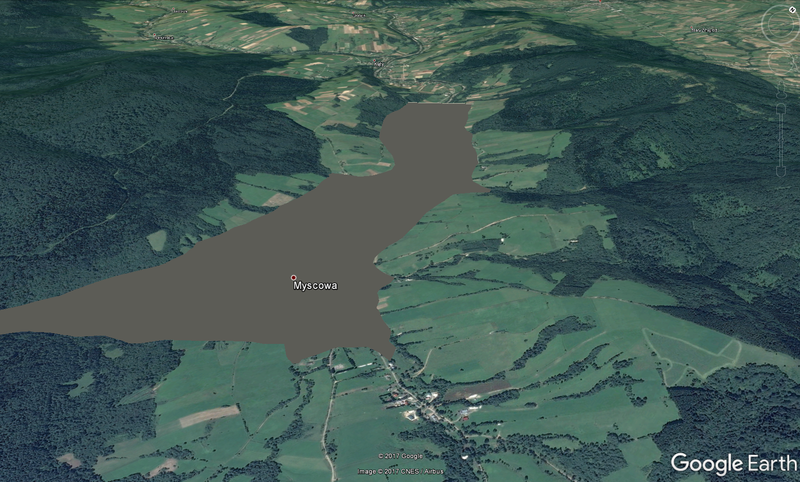 Due to detailed satellite imagery you are able to characterize the interesting area in any line of geographic research. 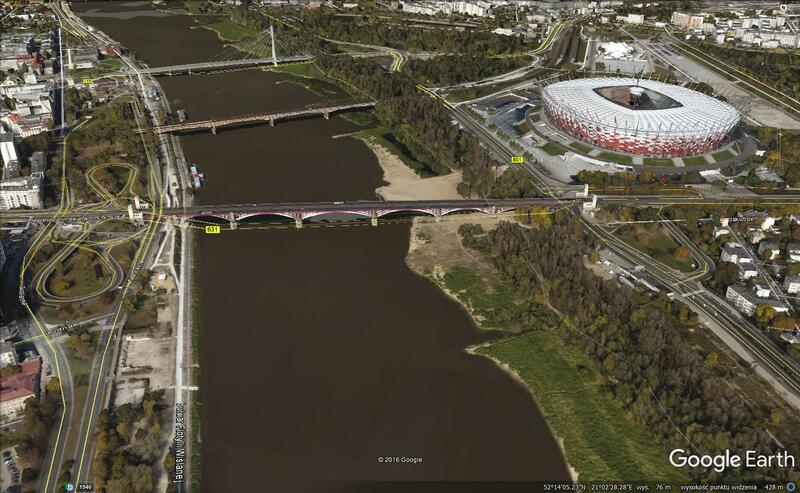 Nowadays the 3D quality imagery is manage to develop across the World, especially in the most populated areas. The 3rd dimension of imagery refers not only to simple objects exist in the geographical space, but also render detailed landforms and terrain declivity of local area. 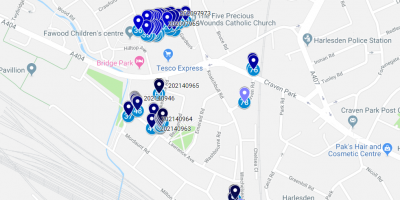 Mapping of disease ranges, in relation to satellite imagery of the area of surveillance, that may be used to create a base-map in GIS software (.shp). Visual imagery from Google Earth can be use to prioritize specific places (landfills, large areas of standing water, etc) for targeted further control interventions. Extraction of urban agriculture sites through the analysis of high-resolution aerial images in conjunction with another GIS software (e.g ArcGIS). It leads to identify and map public and private spaces of food production within big urban areas. Inspection of archeological monuments thanks to detailed remote sensing provided by Google Earth imagery. It may ilustrate how the satellite imagery can be exploited to shed important light on the character and development of the human landscape. Analysing the processes based on external framework, which are available for viewing in the Google Earth application (weather patterns, land coverage, etc.) to demonstrate the process. 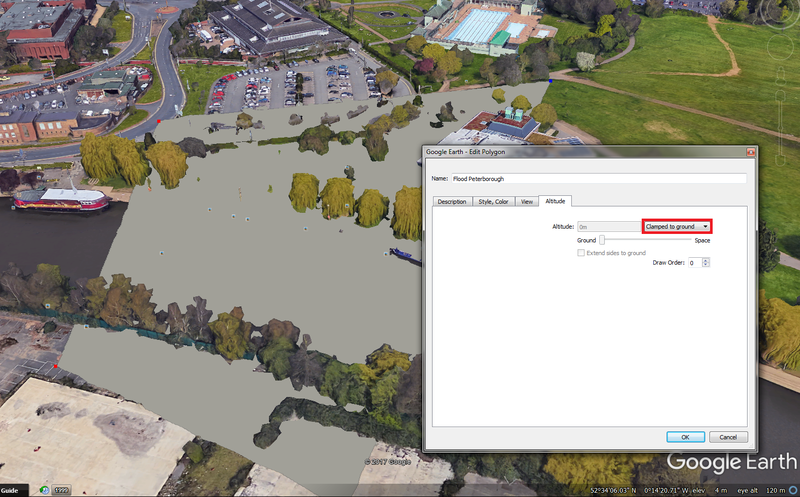 You can demonstrate the process by sharing your work with other Google Earth and other GIS users via the internet. Making land-use plans like geological itinerary stops in some natural park. Thanks to this you are able to establish an conservation protection plan to meet the educational and social needs of society. Every remarked earlier way to use the Google Earth software is helpful in any research sciences and companies. 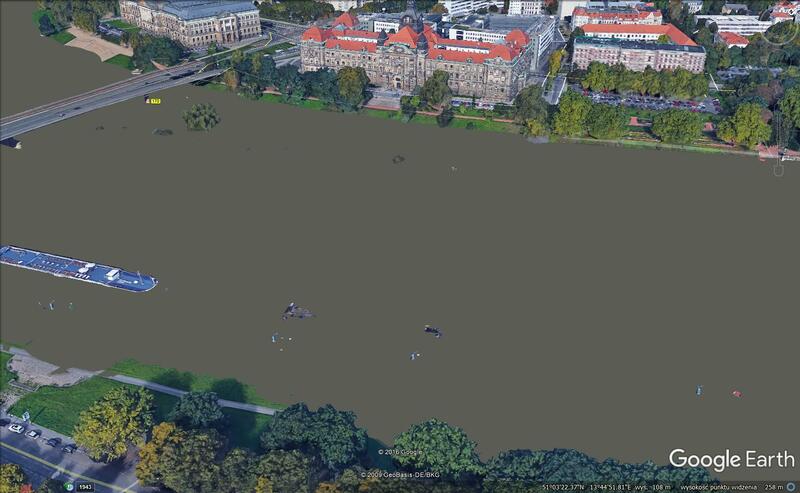 I demonstrated the flood simulation using the Google Earth software for 3 cities: Cambridge (United Kingdom), Warsaw (the capital of Poland) and Dresden (Germany). To manage the biggest flood in those cities I used flood markings and historical data. Appropriate flood simulation can be done by advanced software like flood modeller or global mapper. Software, whichis able to cooperate with numeric terrain model. 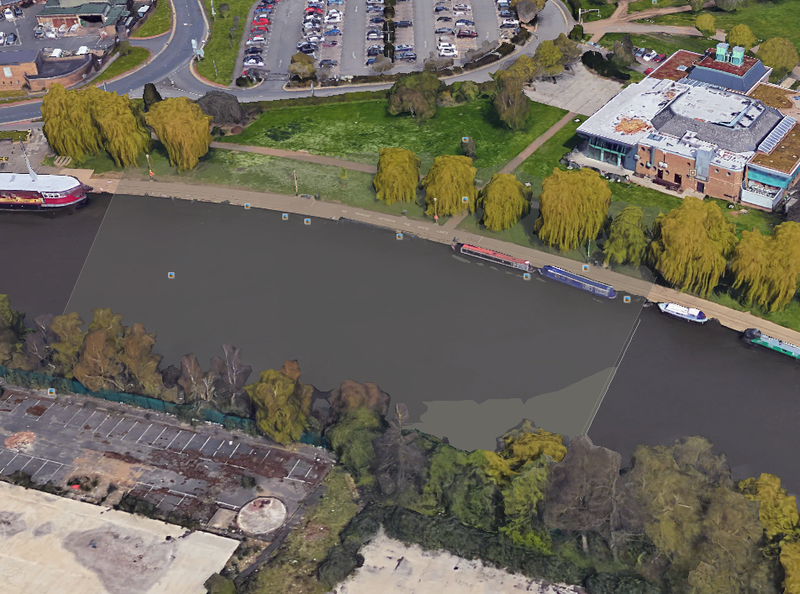 Using Google Earth to flooding occurrences you can simplify the process, however I am telling you in advance that it won’t be accurate enough. 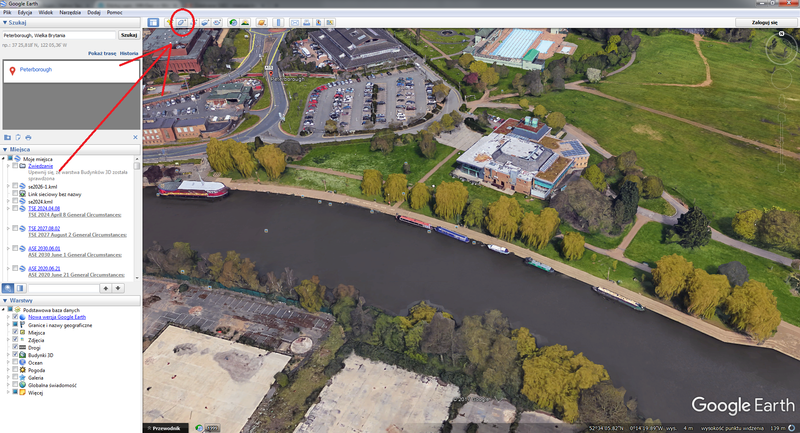 full Google Earth database in conjunction with the flood simulation allows you to delimit some alternative ways of traffic etc when high water occures. 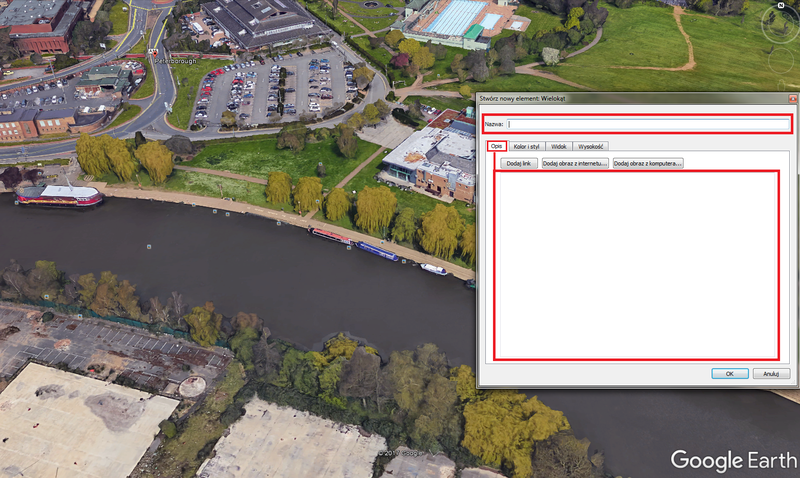 quick save picture in Google Earth gives you a quick way to create a time lapse with flood occurrence. the tool may be perfect to modelling the water reservoirs in mountainous areas. The 3D coverage is not available for many places in the World. It covers mainly the biggest and the most renowned cities. How to create the flood layer? Select “add polygon” from top toolbar (Pic. 1). Pic. 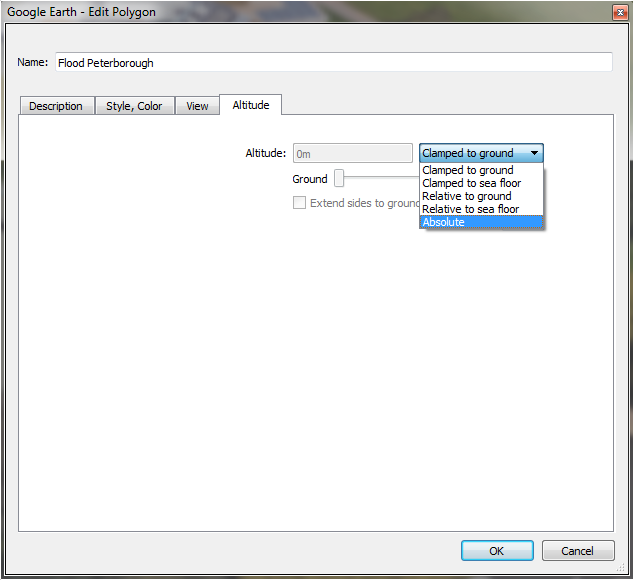 1 Select “Add polygon” from Google Earth top toolbar. 2. 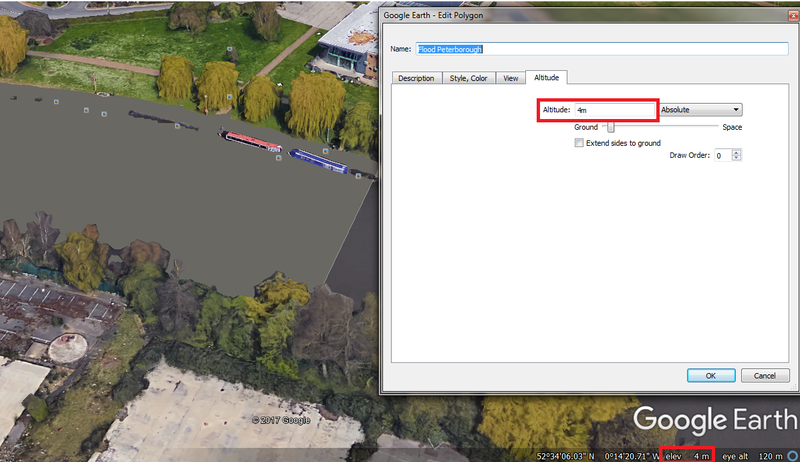 You should receive pop-up window entitled “Google Earth – New Polygon”: in the “name” row put the name of your polygon. You can also add the description below (Pic. 2), hovewer You will deal with it a little bit later. Pic. 2 Name and description of your polygon. 3. Drag the dialogue box back into your view (basically you can pick up 4 points only making the square-shaped area of your simulation)(Pic. 3,4). Pic. 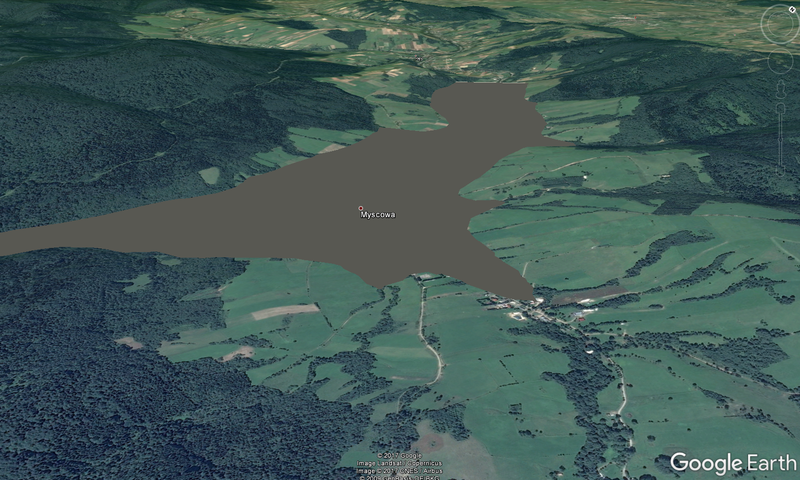 3,4 A new box created in Google Earth exist like a layer. To create it quickly you need only 3 or 4 points. You can also have more points, when your analyse is more advanced. 4. Go to aforementioned pop-up window and pick up your favourite colour, however it’s good to set the similar to flooding river colour. You can set the opacity also. I advice you to put around 90-100%. Do the same both for lines and area (Pic. 5). Pic. 5 Pick up the colour for your newly created box similar to flooding colour (silted, muddy water). 5. Go to “Altitude” sheet and toggle the “Absolute” option rather that “Clamped to ground” selected as a default (Pic. 6,7,8). Pic. 6 Your box layer when clamped to ground. It covers whole area except the 3D objects. Pic. 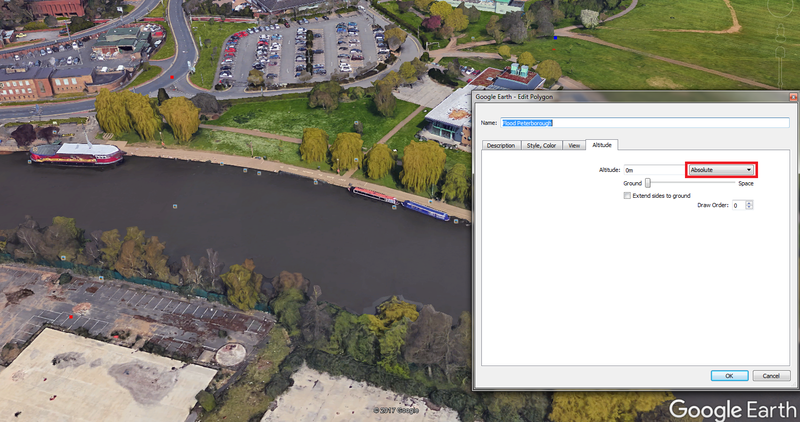 7 The box altitude options in the Google Earth software. Select “Absolute” as per as above. Pic. 8 The box altitude – “absolute”. Your box is arleady gone. 6. On your left side you can adjust the altitude value. Remember that altitude value 0 m is equal the sea level! 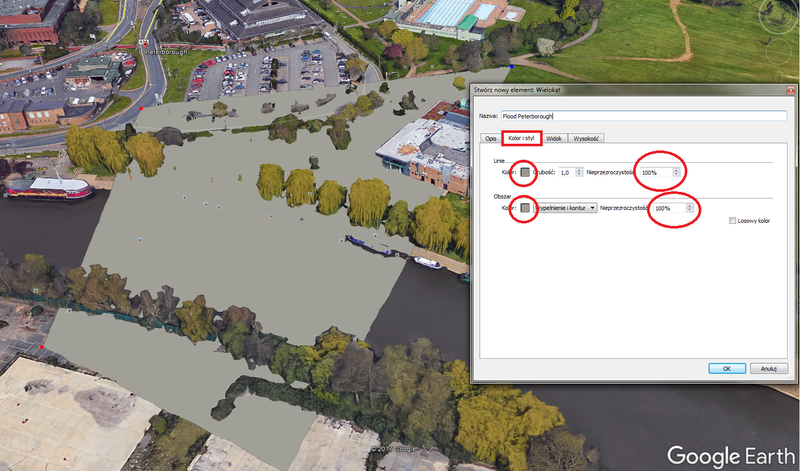 To set right altitude value for the area of your surveillence set the cursor into river bed and see the elevation value in the bottom right corner (pic. 9). Pic. 9 When elevation is 4 m (above sea level) then you need to set atl least 4 m to see your box on the ground. In this case the south Peterborough’s bottomland lies at 4 m above sea level, but the River Nene water level is about 3 m above sea level, thus set your layer at 4 m altitude “makes” the river Nene completely full. Pic. 10 When elevation is 5 m (above sea level) then in the River Nene case we have flood. The foothpath alongside the river is actually out of use due to flood. 7. 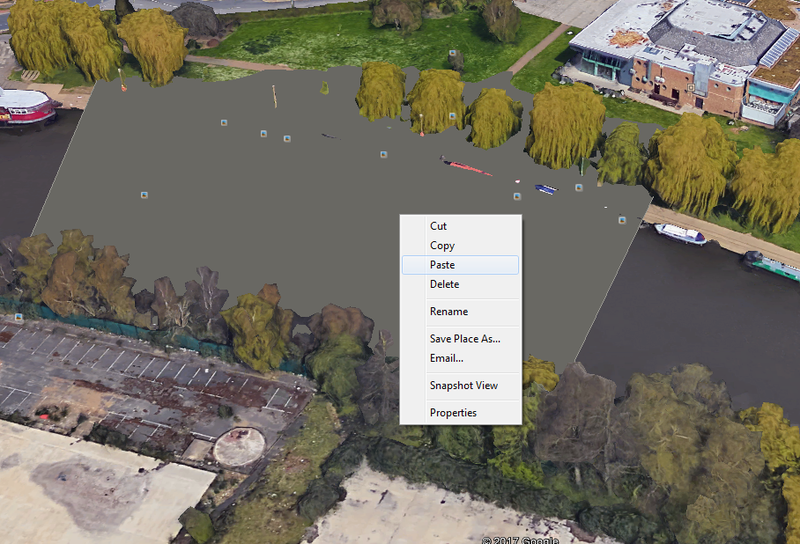 If you can compare your flood in different levels you can copy created layer (right mouse click and select copy) (pic. 11) and paste (pic. 12) (right mouse click and select paste). Remember to close the box window “Edit Polygon” before! Otherwise right click mouse will modify the shape of your box. Altrnatively you can do this operation in your toolbar where you have your box located (pic. 13). To make your visualisation tidy change the opacity of higher level from 90-100% to e.g 30 or 40% and altitude from 5 m to 3 m (Pic. 5,9,14). Pic. 12. …and next “Paste”. Pic. 13. Alternative option in your toolbar. Pic. 14 Finally you received 2 layers: Upper with altitude 5 m and 40% opacity and lower with 3 m altitude and 100% opacity. River Nene heads east, hence lower layer is visible in the right corner. 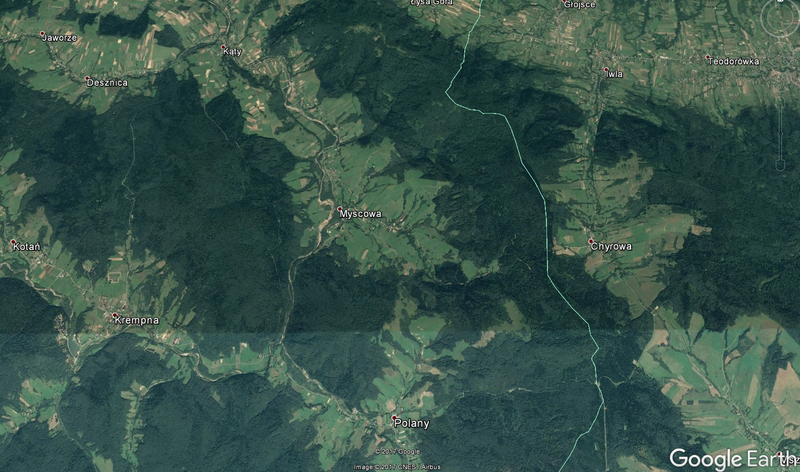 Google Earth doesn’t take the terrain declivity into account. Pic. 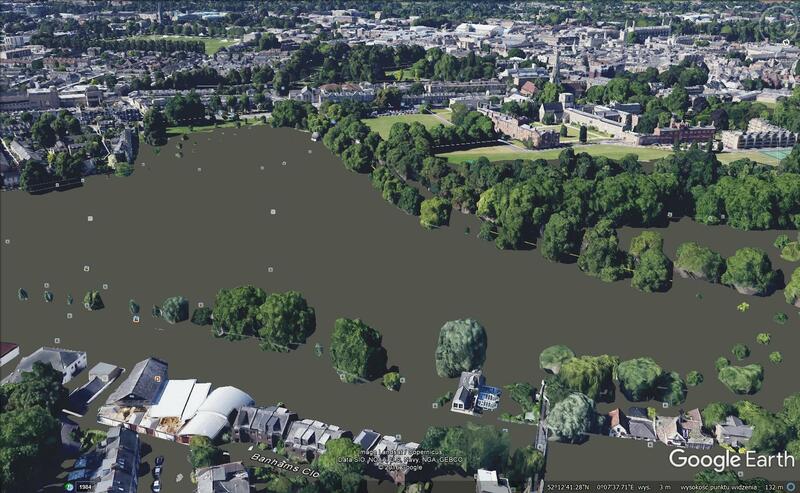 15,16 Cambridge, Midsummer Common during the highest flood, which may be possible in Cambridge. Pic. 17 The Cambridge city centre during the extremal flood situation. Cambridge lies in the Cam river valley. 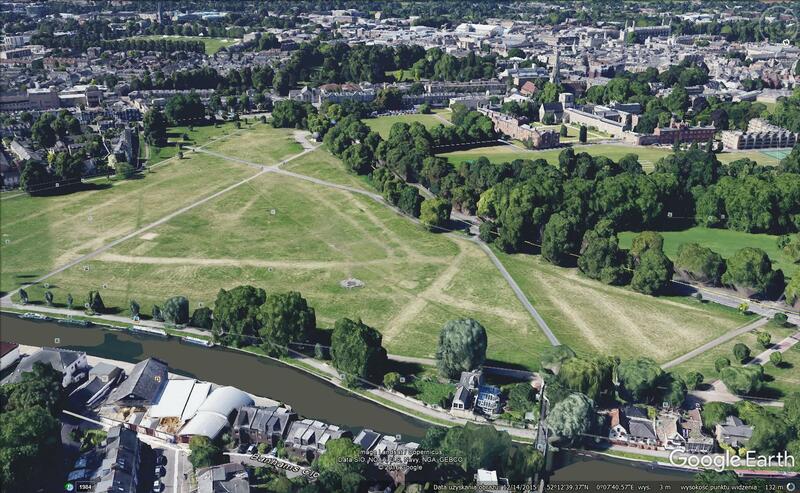 The river Cam is a short (64 km-length) lowland river, which didi’t cause a big floods in last decades. 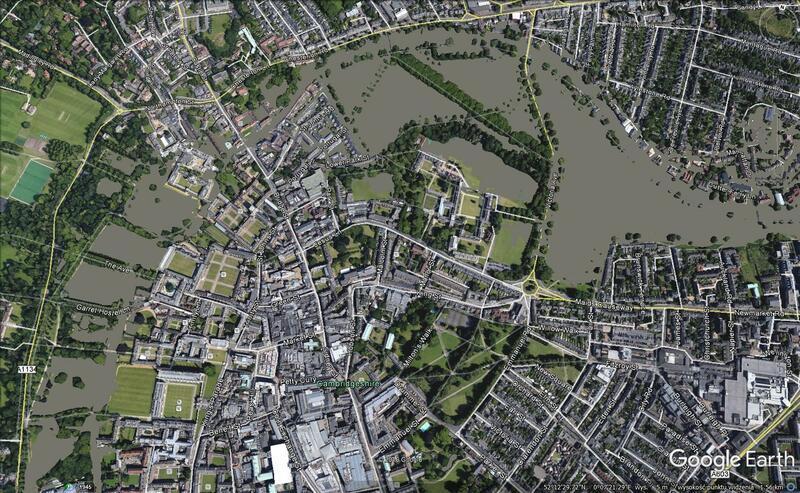 The biggest marked flood in Cambridge occured in 1947 and 1973 (pic. 18). 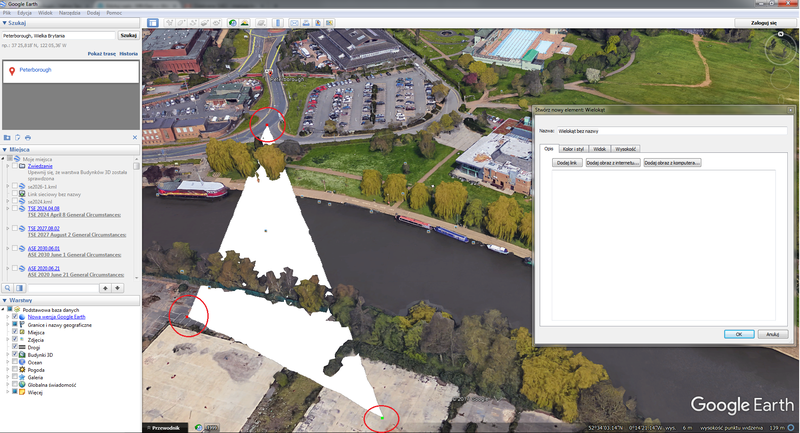 However the GIS stuff contains areas inside the city, which are excluded due to flood risk. The best example of this is Midsummer Common and Jesus Green – the lowest situated areas in the city centre. Pic. 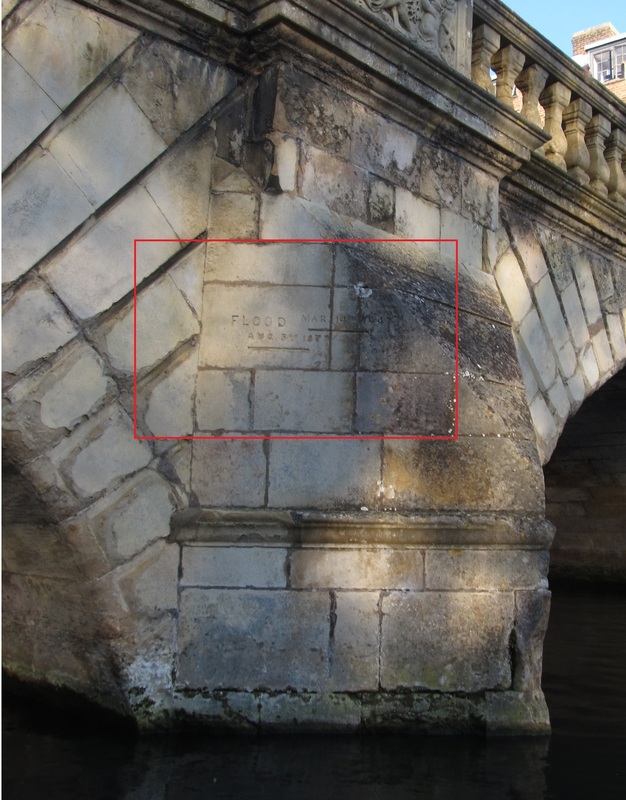 18 Flood marks on St Jone’s College bridge in Cambridge. Pic. 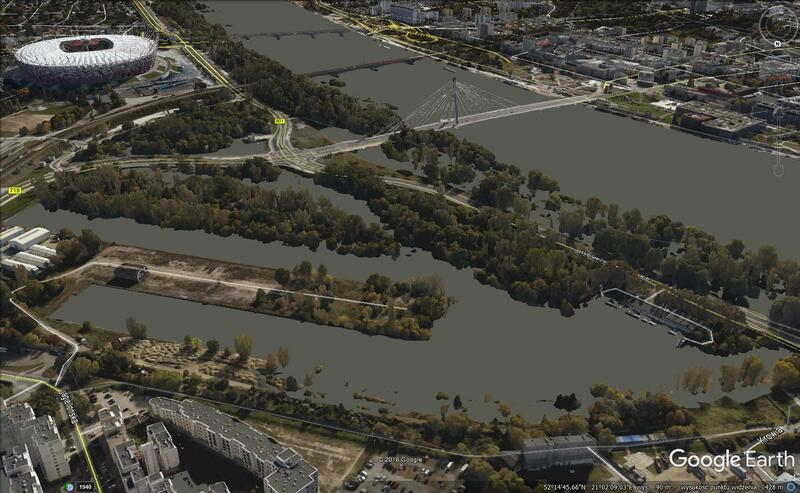 19,20 Central Warsaw flood simulation with view towards Świętokrzyski bridge. Pic. 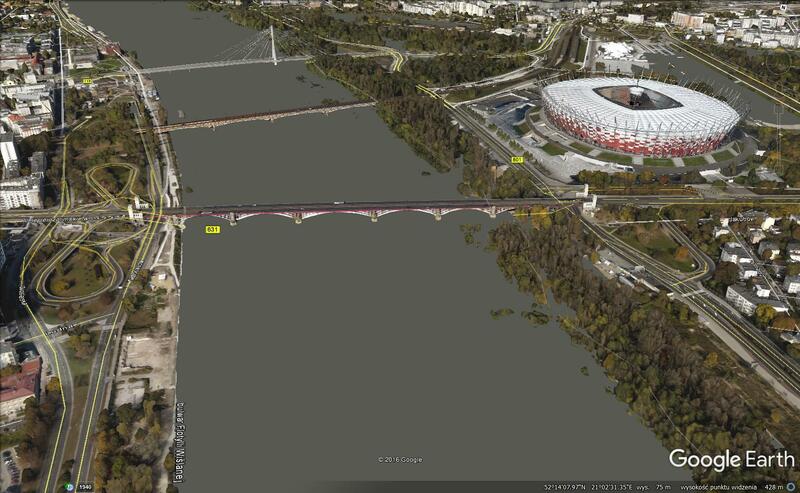 21 – 23 Central Warsaw flood simulation with view towards National Stadium and Świętokrzyski Bridge from the north-east: 1 – maximal flood, 2 – layer with receeded maximal flood (40% opacity) + “current flood level” layer (100% opacity), 3 – no flood. The area, which had been inundated remains silted when flood receding, so Pic. 22 shows clearly relation between maximal flood level (layer with 40% opacity) and current flood level (layer with 100% opacity). 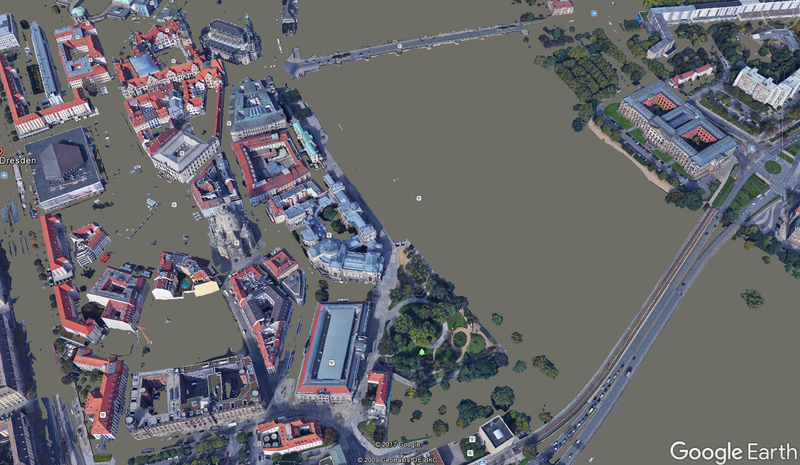 The layer with 40% opacity showing us the flood’s effect in the central Warsaw. Pic. 19 and 23 shows the situation when flood layer is equal the altitude of Vistula river water level – 78 m above mean sea level. 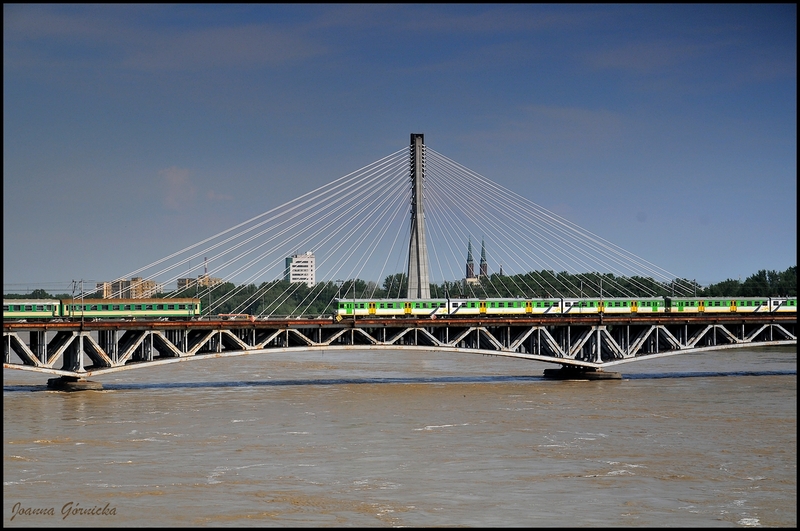 According to the historical measurements the highest level ever recorded of Vistula river – 863 cm was in 1844. 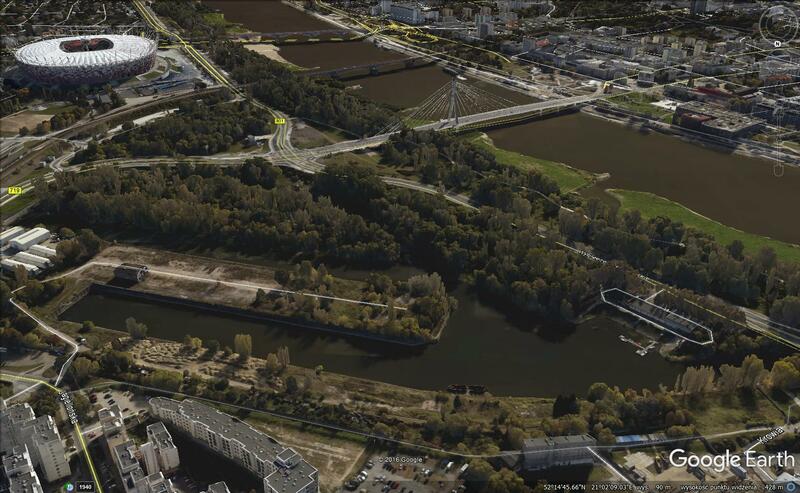 Pushing the flood layer 9 m up we can see how the biggest flood in Warsaw could be like (Pic. 20,21) then. Pic. 24 Flood in Warsaw, June 2010 (photo by Joanna Górnicka, Panoramio.com). Last big flood in Warsaw occured in May and June 2010. The highest flooding level was recorded on 22nd May – 780 cm. Dresden witnessed the biggest flood recently, in 2002 when flooding level on the Elbe river reached 9,4 m and swamped majority of the Old Town. Many landmarks was totally surrounded by water. 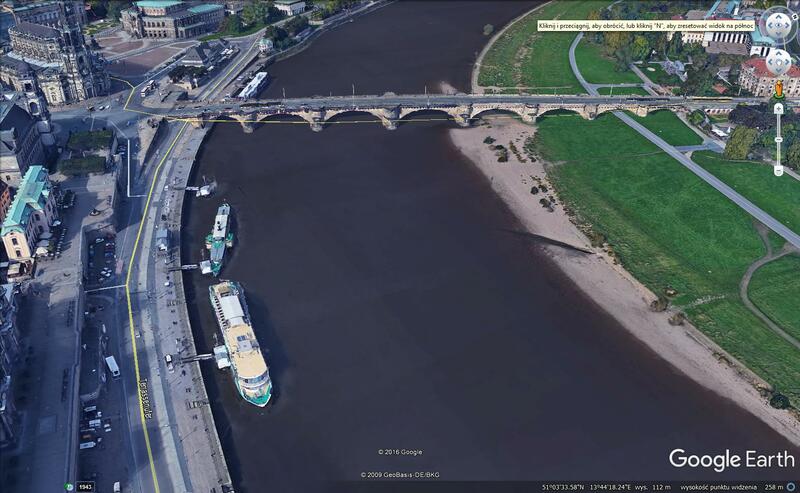 According to the Google simulation it’s good to know, that Elbe river water level lays on 104 m above mean sea level (in the vicinity of the Augustus Bridge). To ilustrate the flooding level from 2002 we need to lift up our layer onto 113 m.
Pic. 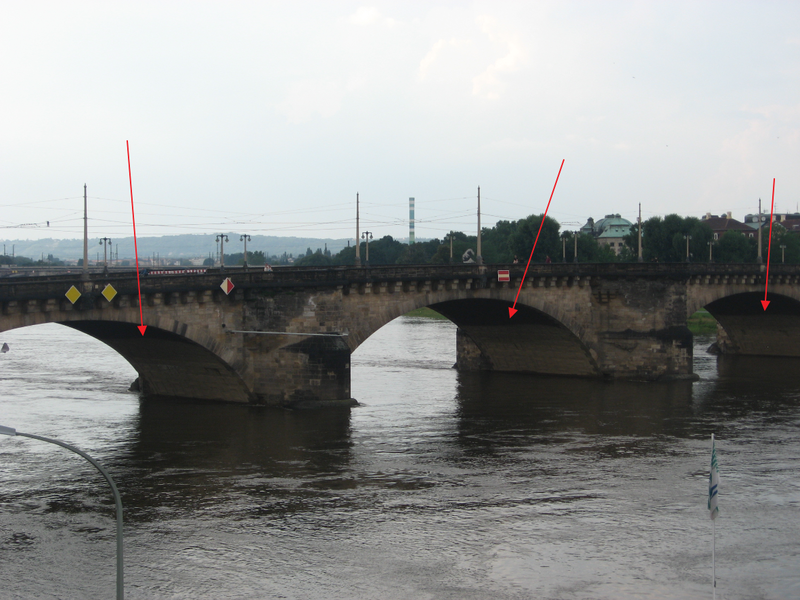 25 – 27 Dresden flood simulation: 1 – no flood, 2 – flooding level 7 m, 3 – flooding level 9 m, that remains the flood in 2002. Pic. 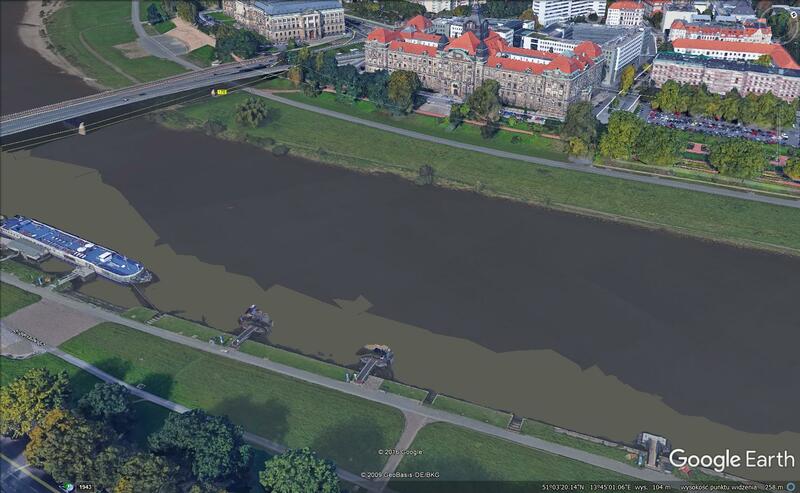 28, 29 The flood effects in Dresden displayed by 2 layers, where lower layer (100% opacity) is showing actual water level and upper, transparent (40% opacity) layer is showing the maximal flooding level, which occured. Pic. 30 The Augustus Bridge clearly remember the biggest recent flood in Dresden. The water reservoir visualization is a perfect way to simulate how your region could be looking when water dam exist. There are many places in the World where countries and their governments are going to build a new reservoirs to protect flooding areas. 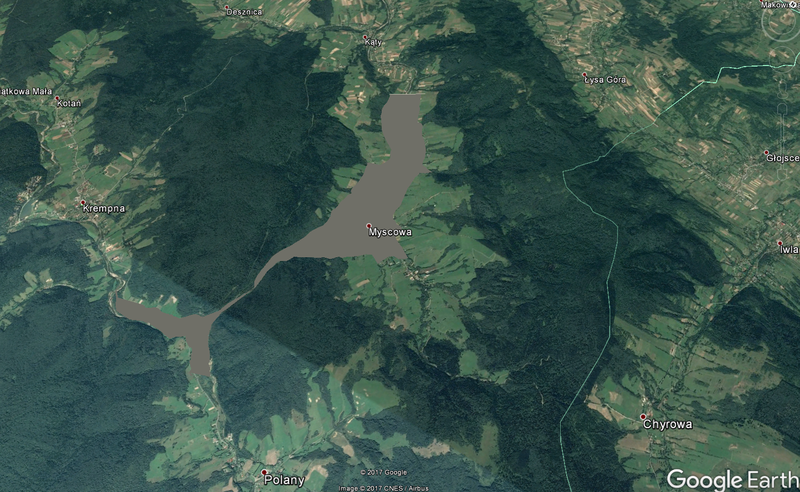 I would like to give you an example of Kąty – Myscowa water reservoir in southern Poland, which is to be build in the future. This project has been postponed several times, although the local inhabitants are aware that they will have to move somewhere outside the planned inestment. Kąty and Myscowa are two small villages situated inside the Beskid Niski range in the Wisłoka river valley. The top of dam is planned to have 43 m height, so basically the newly created lake is going to reach Krempna, the capital of the Magurski National Park! (Pic. 32). Pic. 31, 32 The water reservoir Kąty-Myscowa vizualisation: 1 – before, 2 – after. The base is situated around 318 m above mean sea level so once water level will be increased up to 361 m the bottom of the lake is going to reach Krempna village. Taking into account, that water level will not be equally high as the top of the dam we can considerate the 356 m as a main water reservoir level. In this case the backwater will be situated around 1,2 km from the Krempna village centre (Pic. 33). Pic. 33. 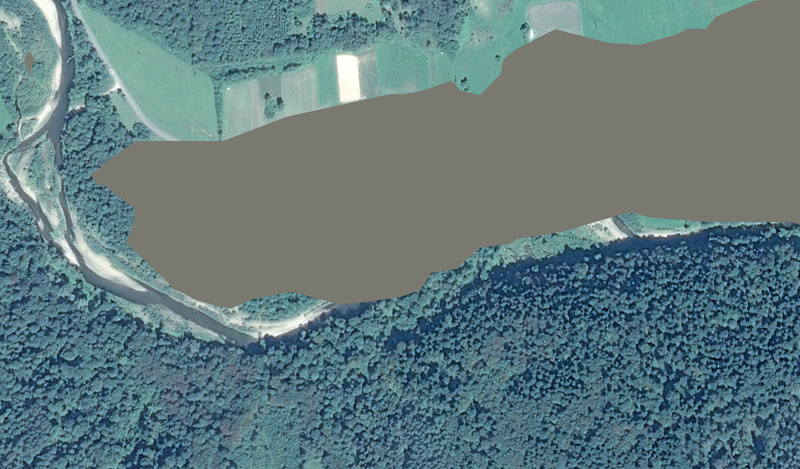 The Kąty-Myscowa water reservoir vizualisation when water level altitude is 356 m.
Only the easternmost part of the Myscowa village (The Koniec Górny hamlet) should be untouched. In the heat of this situation it will probably turn into a nice summer resort (Pic. 34, 35, 36). Pic. 34 – 36. The Myscowa-Kąty water reservoir vizualisation: 1 – before, 2 – after (361 m), 3 – after (356 m above mean sea level). Pic. 37. 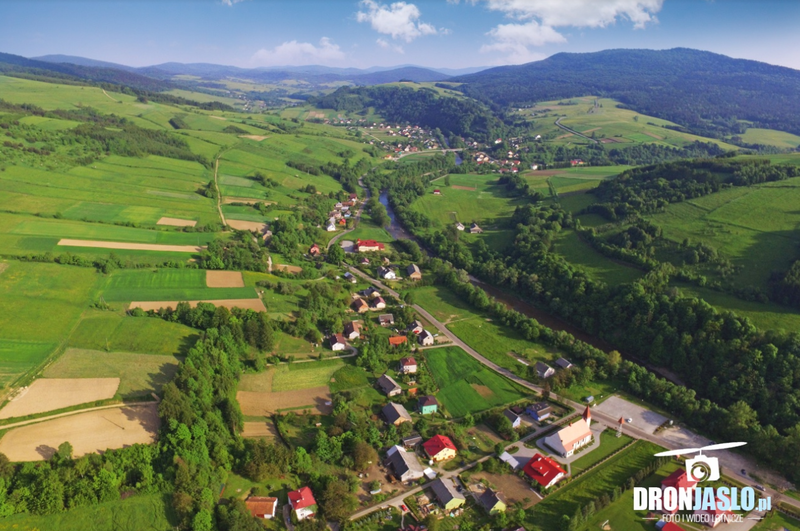 The Kąty village and Myscowa village beyond seen from the drone (dronjaslo.pl). Unfortunately lack of the three-dimensional view of the small-sized areas outside the high-populated regions eliminates the opportunity of detailed simulation (Pic. 38). However this is not needed when looking for this area in macroscale. Pic. 38. 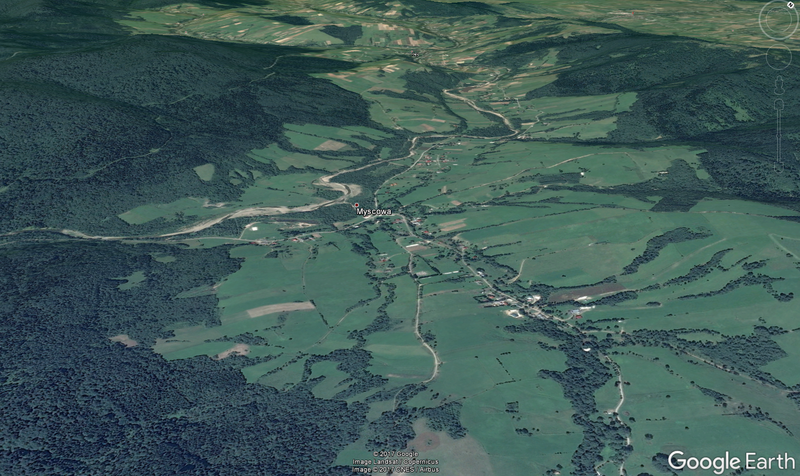 The inconsintency between the terrain declivity provided by Google Earth and local dip. The river bed is outside the inundated area. Besides we should hope that 3D detailed coverage will continue to extendacross the World. 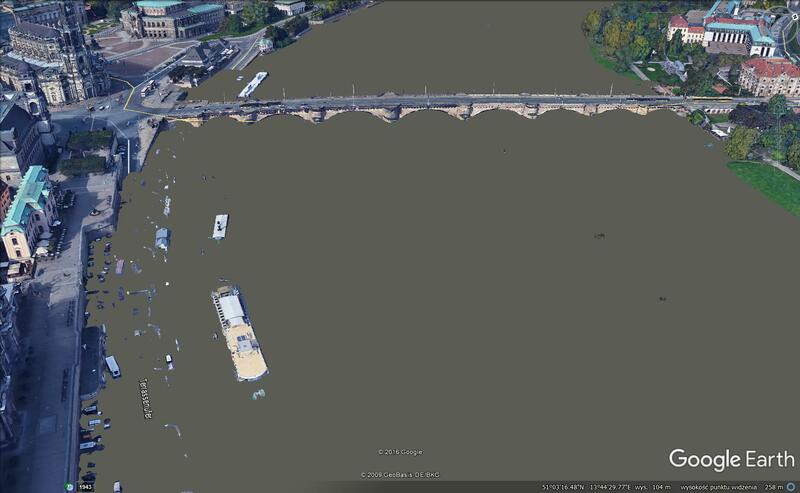 The flood simulation through Google Earth is the easiest way to check the flood hazard in area of your interest. 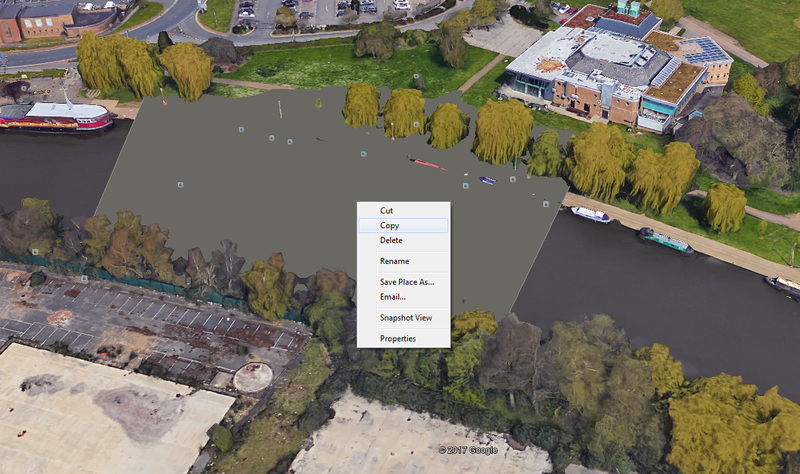 Instead of advanced software, which demands proper GIS skills to manage the flood using digital terrain mode the Google Earth gives you the quickest and the easiest way to do it. Unfortunately isn’t equally detailed against the professional GIS tools. 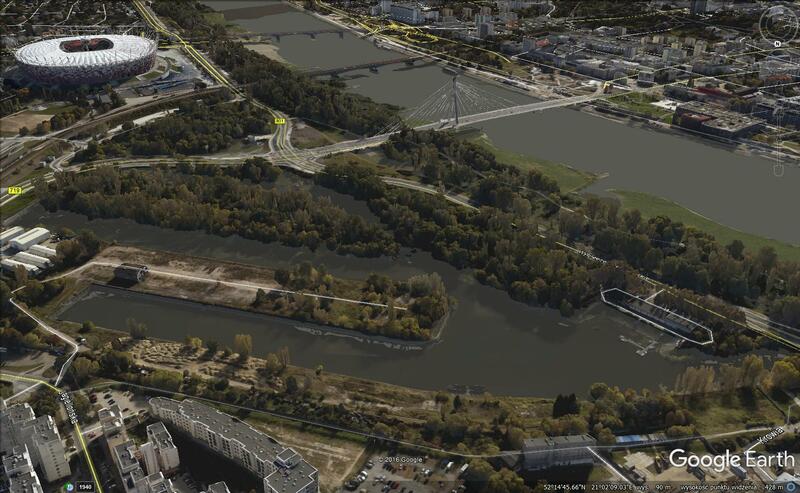 The simulation of flood risk using the Google Earth software may be handy to seek alternative ways of communication and protection of urban areas in case of flood arise. 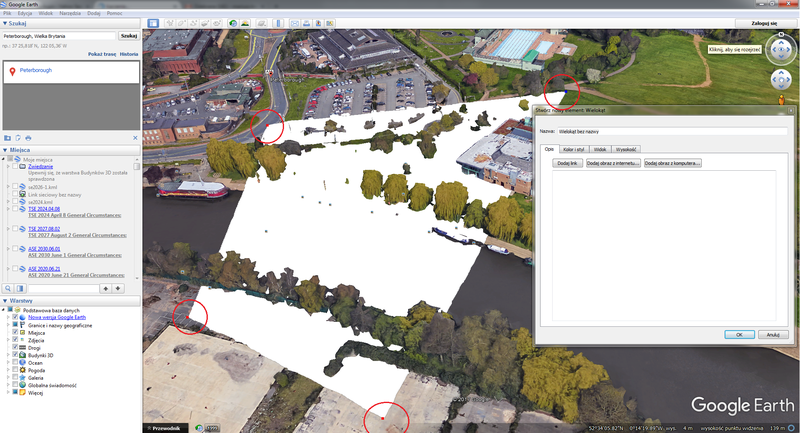 The ease of methode should allow to check the flood hazard by everyone who uses the Google Earth. Moreover you can use this process to simulate the water reservoir in your interesting (mountainuous) area. Aleen Y Chang, et. all, 2009, Combining Google Earth and GIS mapping technologies in a dengue surveillence system for developing countries, (in:)International Journal of Health Geographics. Kennedy D., BishopM.C., 2011, Google Earth and the archeology of Saudi Arabia. A case study from the Jeddah area, (in:) Journal of Archeological Science, vol. 36, issue 3, p. 1284-1293. Lisle J.L., 2006, Google Earth: a new geological resource, (in:) Geology Today, vol. 22 issue 1, p.29-32. Martinez-Grana A.M., Cimera C.,A, Goy, J.L., 2013, A virtual tour of geological heritage: Valourising geodiversity using Google Earth and QR code, (in:) Computer & Geosciences, vol. 61, p. 83-93. Taylor J.R., Taylor-Lowell S., 2012, Mapping public and private spaces of urban agriculture in Chicago through the analysis of high-resolution aerial images in Google Earth, (in:) Landscape and Urban Planning, vol. 108, issue 1, p.57-70. Travis M.S, Lakshmanan V., 2006, Utilising Google Earth as a GIS platform for weather applications. 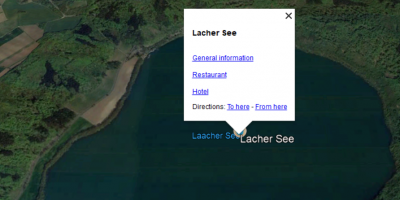 Flood simulation in Google Earth – how to?